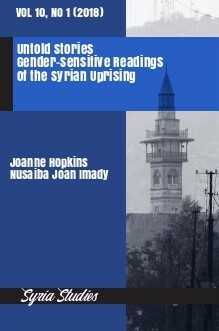 In Framing Disaster, Performativity & Desire in the Writings of Syrians in Diaspora, Nusaiba Joan Imady examines the ways in which “… Syrians in diaspora have explored and redefined meaning in tradition and culture, specifically in relation to sexual violence, Syrian identity, and the validity of queer desire.” She seeks to capture the responses that are in danger of being lost in this now almost eight-year conflict, responses that collectively constitute a narrative that explains how people ‘surpass’ destruction of this magnitude and provides insights on the type of Syria that will eventually emerge from this ongoing tragedy. IMADY, Nusaiba Joan. Framing Disaster. Syria Studies, [S.l. ], v. 10, n. 1, p. 25-51, nov. 2018. ISSN 2056-3175. Available at: <https://ojs.st-andrews.ac.uk/index.php/syria/article/view/1691>. Date accessed: 19 apr. 2019.